At Enmore Box, we carry a broad range of new packing boxes that are available in stock in many convenient sizes. Our boxes are made in high-quality board grade and are suitable for most purposes. Sizes, board grades & pallet quantities are listed below. Then all boxes are charged @ 1/2pallet rate. 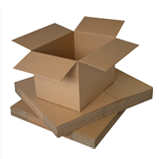 We can also provide made-to-order cardboard boxes in any required size for specific requirements. We also carry packaging supplies for all your needs. If you need boxes for moving, we have excellent quality second hand boxes also available on our moving house page. We have many boxes for sale including moving boxes available on this site.